The finished balcony therefore incorporates all of the above into a bespoke balcony design in the depth and width requested in order to maximise outdoor space, retain the garden view and introduce privacy from neighbouring properties. 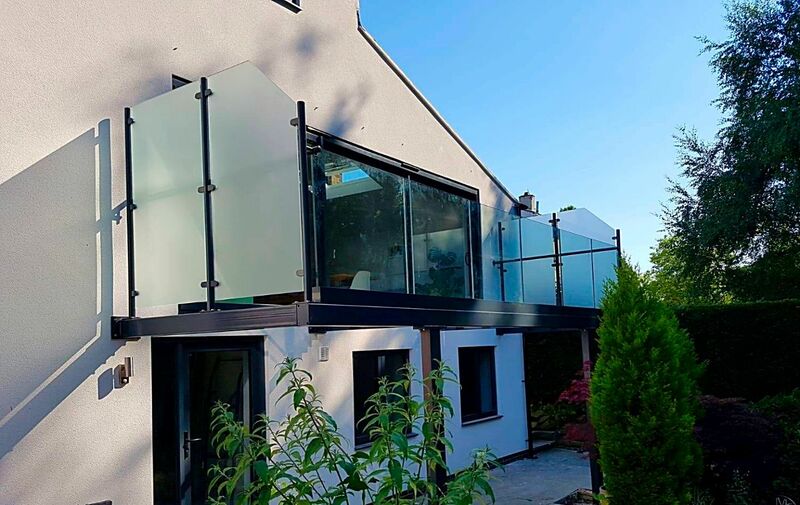 The steel balcony structure and glass railing was designed, manufactured and installed by DioMet and features a mix of our different balustrade materials and designs. The side screens are based on our System 10 powdercoated balustrade design - using upright baluster posts and handrail whereas the frameless balustrade to the front is our System 4 channel type. The frameless infinity-view frontage is toughened and laminated glass with no handrail to maintain a clear outward view and the base channel support structure is powdercoated to match the rest of the steelwork.